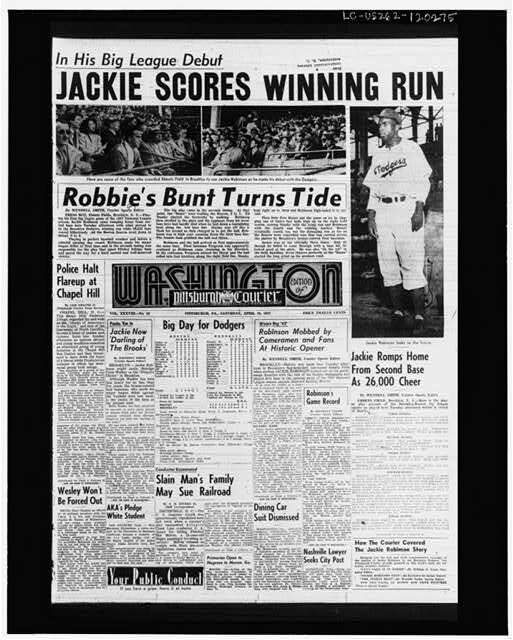 Brooklyn Dodgers General Manager Branch Rickey decided to "take a chance" on Jackie. In 1946, Jackie played for the Montreal Royals, the Dodgers' top farm team. He played second base on a team that won the Little World Series, the minor-league equivalent of the Major Leagues' World Series. Jackie scored the winning run in the decisive seventh game. That same year, he married Rachel Isum. Their first child, Jackie Jr., was born a year later. Two more children, Sharon and David, followed during the next five years. Robinson was so impressive as a member of the Montreal Royals that Rickey had him promoted to the major-league team. His first game was April 15, 1947. He didn't get a hit that day, but he reached base anyway, on an error, and scored the winning run. He was 28 years old and playing in the Major Leagues, the first African-American ever to do so. He played first base that year because someone else had the starting second-base job. He found very few friends, though, that year, either in baseball or in the stands. Other players wouldn't talk to him; even other Dodgers wanted nothing to do with him. Other players would slide in to first base with their spikes pointed high, aiming to injure Jackie. When Jackie was in the batter's box, opposing teams' catchers would spit on his shoes. Opposing pitchers would aim their pitches at Jackie's head or his body, not exactly over the plate. People in the stands shouted terrible things to Jackie, about himself and his family. They threw black cats on the field. They threw other things as well. Many people threatened to kill him. And as much as other people did terrible things to Jackie and said terrible things about him, he kept silent. He had promised Branch Rickey, the Dodgers General Manager, that he would not respond with violence or with shouts back; instead, Rickey urged him to appear above it all. He was to endure all of the abuse with quiet confidence, showing that he knew that he belonged in the Major Leagues, playing alongside and against white players. He was to let his baseball abilities do the talking. Rickey told Robinson this: "Jackie, weve got no army. Theres virtually nobody on our side. No owner, no umpires, very few newspapermen. And Im afraid that many fans may be hostile. Well be in a tough position. We can win only if we can convince the world that I am doing this because youre a great ballplayer, and a fine gentleman."